It’s release day for Daring and Decorum, so I thought I’d share an expanded version of the Acknowledgments. Here are the acknowledgments as they appear in the novel. Thanks to everyone who helped bring my novel to the world! My first debt goes to all the writers who inspired me, Ellen Kushner chief among them. Privilege of the Sword showed me what was possible in combining a comedy of manners with melodrama, all while imagining an alternative Europe where people were pretty much free to love whom they chose. Emma Donoghue’s Life Mask introduced me both to late-eighteenth-century England and to ways of imagining how those of non-conforming sexualities might have fit into it. Nicola Griffith: both she and her vision of St. Hilda, as told in Hild, are my heroes. Though I came to it after I finished this book, Heather Rose Jones’ Daughter of Mystery inspired me to keep seeking a home for my own novel. You should probably read these #ownvoices before reading my attempt at historical representation of women who love women, which must inevitably rely on imagination (and research). Both Mari Christie’s (Mariana Gabrielle’s) La Déesse Noire: The Black Goddess and Katharine Grant’s Sedition provided examples of how to gracefully include voices that are not our own in historical fiction. Is it appropriate to thank a dead author? I wouldn’t be anywhere without Jane Austen. And Alfred Noyes may be dead, but it was Loreena McKennitt’s superb musical rendition of The Highwayman that first put the idea for this novel into my head. Thanks to my beta readers, Jeannie Miernik, Judy Spanogle, J Marcus Newman, Anne Simon, and Christina Mitchell, all of whom gave me valuable encouragement and advice. Without them, this novel would still be just a file on my computer. Numerous books and sites helped in research for this novel, including Kirstin Olsen’s Daily Life in 18th-Century England; David M. Shapard’s annotated editions of Jane Austen’s novels; Emma Donoghue’s Passions Between Women; the Jane Austen’s World blog and many other Regency-centric history sites, so numerous thanks to the popularity of the Regency Romance; Rictor Norton’s website, which includes not only eighteenth-century British gay and lesbian history, but also a section on the Georgian Underworld; and Stephen Hart’s Cant: A Gentleman’s Guide, as well as his Pascal Bonenfant website. Capital City Writers Association (my RL writing community) and Speakeasy Scribes (my online one) provided invaluable support and camaraderie during the long process of finding a home for Daring and Decorum. And finally, thanks to Diane Willcox, my alpha reader, partner, and wife, who has shown superhuman patience with my transition from nonfiction to fiction. Without her, I would still be a typesetter, or more likely (given what has happened to that occupation) unemployed and homeless. All my love always. I don’t know how I failed to mention her, but C.E. Case at Supposed Crimes has been unfailingly encouraging and thoughtful throughout the publishing process, and open to many of my ideas as well. My book would be nowhere without such a supportive publisher. 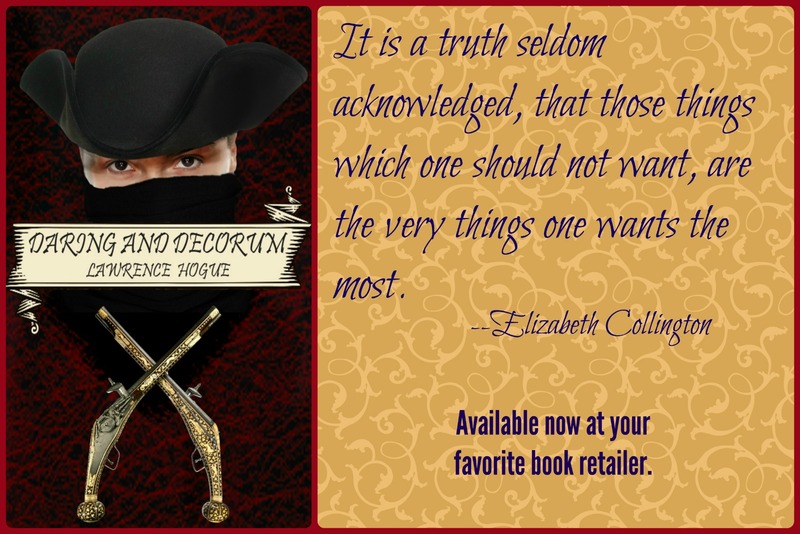 Of course, if you haven’t yet snagged a copy of Daring and Decorum, I hope you’ll do so today! You can order it at your local bookshop, or at the usual online places. Buy links and more are here.